The BitPerfect Reference 1 is a comprehensively equipped and complex beast, but it can be set up to be appropriately commodity-like if the user prefers it. Company owner Karl Woodward, who has been involved with computers and pro audio for many years, opines that if his six-year-old daughter can figure out how to record, store and play media from disk, then he knows it will be plain sailing for any adult. We tested the Reference 1 solely as a music server, but it also makes a very respectable video server having come about because Karl wanted a simple-to-operate, high-performance entertainment hub for his family at home. If one is building a high-quality, PC-based music server, it does not involve too much additional effort to add video capabilities into the mix. The suite of software that comes with the Reference 1 presents users with considerable opportunities. Do as we did and place it in a broadband-connected room with a music system and it will download music from the internet or let you listen to internet radio. It will also rip CDs, and retrieve metadata and cover art from the internet to allow you to store that music in its library or on any machine or device connected to the same network. The primary software installed on the Reference 1 for organising and replaying music is Media Monkey. If the Reference 1 is located in a room where there is a television or projector, not only can that be used as the interface for controlling the server but users can rip their DVDs (including Blu-ray titles, where legal, the manufacturer insists) onto the unit – or network attached storage device – and watch them back through the Reference 1's HDMI connection, with the benefit of enhanced sound and picture quality. It is worth noting that much of the software on the player is 'tweaked', so users need to be careful not to erase it: the installed version of the easy-option, Windows Media Player, for example, can, nonetheless, handle 24-bit/96kHz FLAC files without the additional plug-ins that the standard version needs. Finally, one could always install MicroSoft Office and send emails while listening to music, provided your collection of rips is sufficiently uninspiring. The BitPerfect Reference 1 is based on a high-specification Asus motherboard with an AMD dual core processor running at 3.0 GHz, along with fast DDR3 (Dual Data Rate) memory. All this makes the machine a speedy and responsive performer, even when running Windows Vista. The OS is not the plain type you might have on your home PC, but has undergone many modifications and has numerous proprietary plug-ins and codecs (added by BitPerfect) to deliver the sound quality any audiophile listener will demand. The Reference 1 also benefits from the highly regarded (in professional circles) E-mu 0404 PCI sound card, which offers 24-bit sound at up to 192kHz from its on-board crystal – or an external clock that BitPerfect will happily source and supply for you. The DAC is an AKM AK4395 and all the external connections to the card – digital and analogue in/ out – are provided through flying breakout leads, which, unusually in audiophile circles, employ quarter-inch jacks alongside the more conventional RCA and Toslink sockets. As the review system predominantly uses DIN sockets, a phone call to the ever-helpful Chord Company secured suitably terminated analogue interconnects. 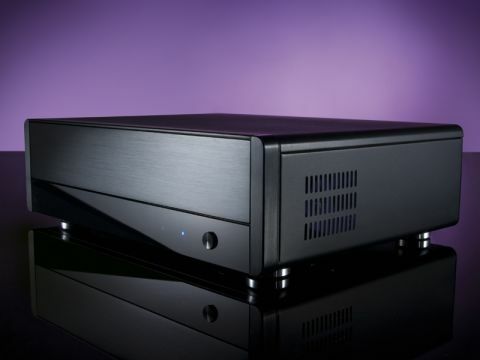 The Reference 1 is housed in a modified all-aluminium Silverstone LC04 case, one of the most spacious and stylish HTPC (Home Theatre PC) enclosures on the market. The case integrated effortlessly with the host of Naim components on the system racks, except for its rather bright, blue power indicator. Given that the BitPerfect is personalised-to-order, the company could remove or adapt the light if you find it intrusive. Ripping duties fall to a LG drawer-loading Blu-ray/DVD-ROM drive, tested for offset before installation, while a two-terabyte Western Digital Caviar Intellidrive hard disk offers quiet, ecologically friendly storage. The SATA (Serial Advanced Technology Attachment) cables to these devices are shielded locking types – built to MOD standards – and are superior to the usual low-rent types provided by most manufacturers, which are seldom great performers. One or two further seemingly small points are worth mentioning, just to demonstrate the lengths to which this company will go to ensure its servers deliver the finest sound – and picture – quality. Its cables are irradiated – that's right, nuked – for enhanced performance. This, they tell us, eliminates any vestige of moisture in the molecular structure of the wire or joints so leaving the copper as pure as can be. BitPerfect assured us, however, that handling these wires will not cause you to glow in the dark. Finally, before installation every part of the main PCB is scrupulously hand-cleaned and inspected and the contacts treated with Kontak contact enhancer to promote long-term reliability.